Homeshake, the soft, groovy quartet led by Pete Sagar, appear to be benefitting greatly from Mac DeMarco's ascendance. 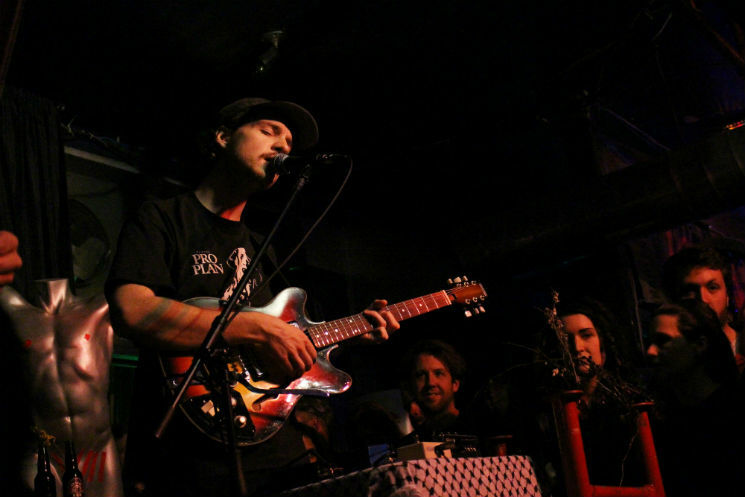 Sagar, a longtime collaborator and guitarist in DeMarco's band, attracted what may have been the largest crowd of this year's OBEY Convention — certainly the largest of the three nights of shows at Menz and Mollyz Bar. It was also, perhaps, the youngest crowd, at least from my vantage point. As I looked through the crowd of 20-somethings swooning to Sagar and company's R&B stylings, I wondered to myself: If this was a hotel lounge instead of a bar, and instead of Homeshake a bunch of well-dressed 50-something men were playing these exact songs, exactly this way… would any of these concertgoers even stop to notice? Perhaps not the fairest comment, I know. After all, part of the appeal of the sort of appropriation Homeshake dabbles in is recontextualizing material from one generation to the next, shaking it out of its original setting and drawing attention to its redeeming qualities. But Homeshake's embrace of late-1970s jazz-tinged R&B is done with an amateurish sensibility that, while creating a bedroom-recording feel on the record, struggled to impress live. Though the band often hit upon a decent groove, there wasn't enough variety in the material for one song to stand out from the next. The one element that could distinguish them — the vocals — were decidedly undistinguished: though the music seems to cry out for a strong, virtuosic crooner, Sagar's soft falsetto lacks force. It all made for a set that, though it had its moments, failed to transcend the novelty of young, casually dressed performers raiding your dad's record collection.